Greetings from the Dairy Goat Society of Australia (DGSA) and its members. Australia has some of the finest Dairy Goats in the world. With excellent production and quality breeding, our dairy goats have been exported to many countries, including Korea, Taiwan, Thailand, Malaysia and Argentina. Inquiries come in regularly. There are 9 breeds of Dairy Goats in Australia, namely the Saanen, the Toggenburg, the British Alpine, the Anglo Nubian, the Australian Melaan, the Australian Brown, the Nigerian Dwarf, the LaMancha, and the Alpine. Whilst there are some large breeders throughout Australia, most of our members have relatively small numbers, up to 50 animals. The commercial dairies run up to 500 animals. 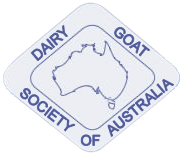 As a service to its members, the Dairy Goat Society of Australia coordinates the exporting of dairy goats. As a guide only, the cost of exporting dairy goats includes the cost of the animal, transportation to quarantine, Vet checks and tests, quarantine fees and export agents. Countries have differing import protocols therefore the testing requirements and length of quarantine confinements vary. We have successfully supplied export orders of 400 animals for shipment by air. Smaller numbers are not a problem either. As dairy goats stress quite easily, shipment by air is regarded as the best means of transportation. Shipment via airports in Sydney, Melbourne, Brisbane and Perth have been undertaken previously without a single loss of an animal. Dairy goats have a distinctive breeding season (March to July), so supply of suitable animals will depend upon the timing of the export order and how long it has been since the previous export sales. Stock must be 6 months of age before they can be tested, hence the minimum age of stock that is exported is around 7 months. The purchase of does of mating age (12 to 18 months) along with a suitable number of bucks is recommended. From the time of an enquiry to the time of the selected goats landing at their destination can take around 6 months or longer. We encourage overseas buyers to inspect our animals by visiting a number of goat dairies and studs. This can be arranged with sufficient notice. You will need an Import Agent to work with our Export Agent to coordinate the project. Further information is available by contacting the DGSA’s Federal Export Liaison Officer.